An electric golf push cart for hilly courses will reduce fatigue and injury massively. They have dropped in price over the years, which means you don’t need to strain yourself carrying the bag or pushing a trolley for 18 holes. The best electric golf push cart is the MotoCaddy S1 Digital Walking Powered Cart that offers every feature and more. More importantly, it is high powered for hilly golf courses and folds easily to put in the trunk of the car. You will want to ensure that the electric golf cart is easy to use because you could end up on YouTube with you chasing after it. Many these days can be controlled through easily accessible buttons and even smartphone applications. 8.5 Should I buy a gas-powered trolley instead? 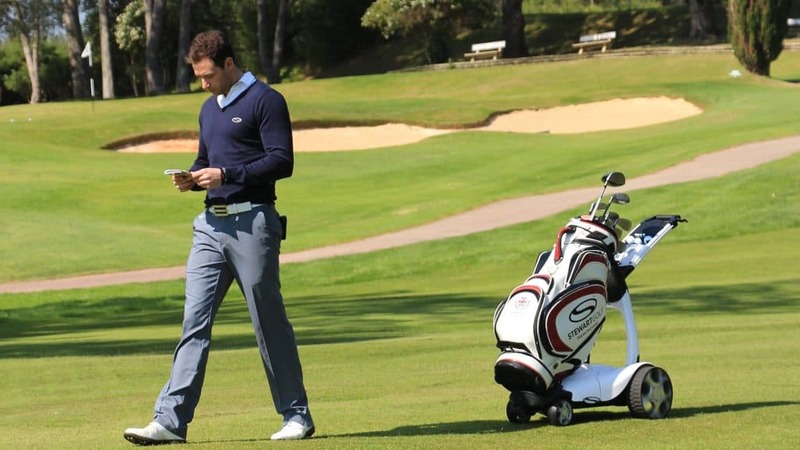 11 Should You Buy An Electric Trolley For Golf? Every electric trolley will have a variable speed control to set to your desired walking pace. This can be tweaked via the buttons on the trolley or by the smartphone. Be sure to test this thoroughly in open space before taking to the fairways. It’s important to note that you will be recharging the batteries, so you will need to be able to collapse and carry the trolley. Therefore, before purchasing a high powered electric trolley, ensure you can pick up the battery weight yourself. 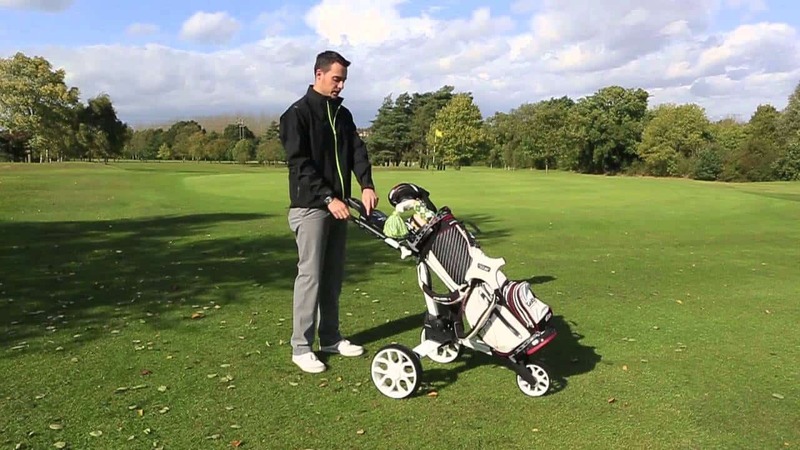 Electric golf trolleys will always be the best method of carrying your golf clubs. Below is a list of the best electric golf trolleys for the money, that aim to reduce fatigue and injury on hilly golf courses. The MotoCaddy S1 is one of many electric golf trolleys that are produced by this manufacturer, but this is the best. The value for money perspective, this is half the price of their other models that don’t offer that much more from the S1 model. The S1 has nine different speed settings that can be easily changed by twisting the speed controller switch. Once the speed has been set, you can press one button to start moving and then tap it again to stop. As the MotoCaddy S1 is made from rigid aluminium, it only weighs 16 pounds, which means it is highly portable. Compared to your standard push golf trolley, it is only 2 pounds heavier. Additional features include the like of a drink holder and an on-board diagnostics in case there was a problem. The battery is not a lithium powered version, although you can upgrade to a lithium powered version. The one provided will easily manage 18 holes and the whole movement will not make much noise. In terms of value for money, the MotoCaddy S1 wins the best cheap electric golf trolley with ease. The price cannot be beaten and even high-end push trolleys are not far of fthe price of the S1. The Stewart Golf X9 is for golfers that want the best electric golf trolley you can buy without worrying about a budget. 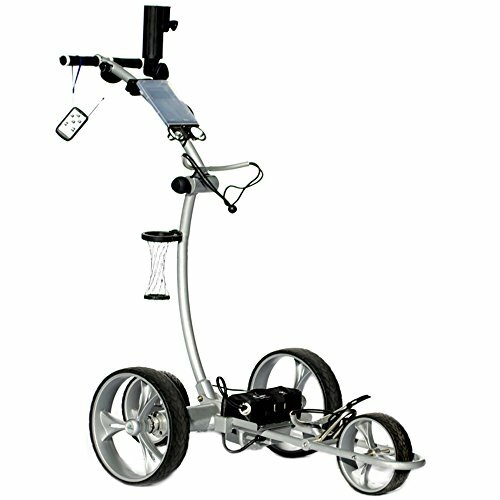 This cart will follow you around the golf course with state of the art Bluetooth following technology. The lithium battery comes with a 2-year warranty and weighs 6.6 pounds. On the topic of weight, the X9 is the latest model that has been on a diet. For example, the wheel has lost 30% of its weight to reduce the stress on the battery. How does it follow you as you play golf? Thanks to two antennas, it creates two zones known as neutral and active. Keeping the remote control in your pocket, the two communicate to determine which zone to be in. When the handset is inside the neutral zone, the X9 will remain stationary. When in the active zone, the X9 will adjust the speed to follow you until the remote control is put back to neutral zone. This may seem a bit confusing, but it’s really very simple. As a tip, when taking your shot, place the remote control onto the cradle located on the trolley. There is also a remote only mode that allows you to use the remote to stop the X9 following you and send it elsewhere. Perfect for when you look for your golf ball in the tall grass (or worse). The x9 is an expensive electric trolley and targeting golfers who want the best. You will not be disappointed whatsoever when you buy the X9 Follow and you will be amazing golfers around the golf course. smallest folding electric golf trolley. It is an average price considering many are over the three-figure mark. If you are looking for an electric golf trolley that is easy to assemble and operate, the Spitzer EL100 is perfect. There is no fancy remote control but you can upgrade to the version that has this feature. There are simple controls on the trolley to adjust the speed and turn it on or off. You can buy extras such as a cup holder or umbrella holder if you require these. For climbing hilly courses or tough rough grass, it has a clever dual tubular motor mated to a lithium battery to ensure easy movement. The charge of the battery should last at least 27 holes of golf. In terms of folding and unfolding the frame, it will take approximately 5 to 10 seconds, which is by far the quickest. Overall the Spitzer EL100 is the best folding electric golf trolley that can easily be transported by hand due to its lightweight design. 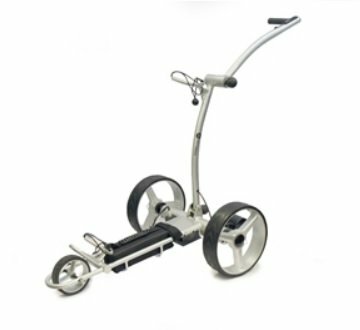 electric golf trolley contains every accessory you could want on your cart. Accessories such as drinks holder, umbrella holder, scorecard holder and golf holder that would all add up with other packages. The lightweight aluminium frame (30 lbs) reduces the stress of the lithium battery, which should last around 36 holes of golf. If you ever ran out of battery due to forgetting to charge it up, it can be switch to a “freewheel” mode for pushing around. There are two motors (180 watt) that can be adjusted to certain speeds with 4 different settings. The low centre of gravity provides excellent stability when on uneven ground near areas such as bunkers. A remote control is also provided that give you additional control of the trolley when on the course. The Cart-Tek GRX-1200R is a great all-rounder with everything you could ask for from an electric golf trolley. It is reasonably priced too, where other models with a similar specification are twice the price. Spin It Golf have targeted the budget electric golf trolley market and it is the cheapest you can buy. Surprisingly at the cheap cost, it still comes with a remote control, battery charger, scorecard holder, umbrella holder, and drink holder. There is also one year’s warranty as a testament to Spin It Golf’s high quality build at a cut price. There is not a lithium battery but a lead battery that will still be able to power through hills and handle approximately 27 holes. It does also have a free wheel mode in case the battery does run out of charge. The GC1R is the cheapest electric golf trolley and has good features. However, compared to the alternatives in this article, it will not feel as high quality but it still has one years warranty as peace of mind. Do you play golf regularly? If you do then you should know already how demanding it can be carrying the bag around the course. It can drain all of your energy, spoiling your game and making you tired. Buying a trolley should only come if you play it more than a few times a week. There are two different types of trolley – manual and powered. The former is more affordable, but the latter has advantages that the former lacks, and they’re less stable than models that are powered either by gas or electric. Do you just play golf once a month? On the other hand, you might find that playing golf only happens once a month, so then you don’t really need to buy an electric golf trolley if you’re thinking of going to the trouble of looking into buying a powered golf trolley. Electric golf trolleys come in different shapes and sizes. They could come with different batteries that are more powerful and more suitable for longer courses and more difficult terrain. They’re also more luxurious than push/pull trolleys that are available. Golf trolleys, whether they’re electrical or not, saves you time and energy, all the better so then you can make the important shots on a course. Many younger players are turning to trolleys to save energy, contrary to the days where the elderly golfer had to go for the option of carting around a buggy or a cart. There are different types of golf trolley, but electric golf trolleys are the saving grave compared to a manual trolley. Designed to carry a golf bag, clubs, and other golf paraphernalia, an electric golf trolley is a hybrid of more familiar products used by golfers – a manual golf trolley and the electric golf cart, and like an electric golf cart, an electric golf trolley works when the operator who steers it around the course. It doesn’t take much physical effort to push. It’s used by players of all ages since it saves energy, so no need to put the extra effort into shoving the trolley carrying your clubs around the course. You just put your clubs on the trolley, and it will electronically transport them to wherever you need them to be under your guidance. With some models, you don’t need to even touch them. 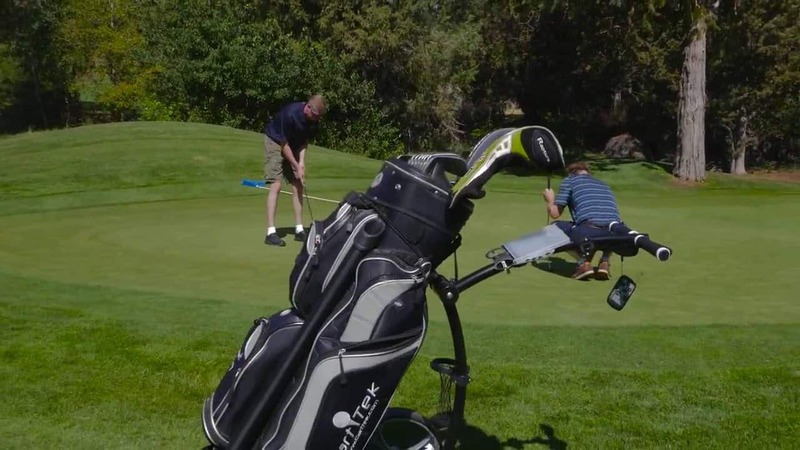 Designed with agility, reliability, and strength in mind, the electric golf trolley can answer the hopes of people who don’t want to spend all day lugging their bulky golf bags, clubs and other pieces of equipment around a course. Manual and push trolleys can help relieve some of the stress, but this product is becoming much more popular. Typically the electric golf trolley is more expensive than their older counterparts, but it’s a good investment in the long run. It can also save health problems in the long run as well, allowing you to focus on the game and not on your back or arms which are probably straining from carrying the bag. 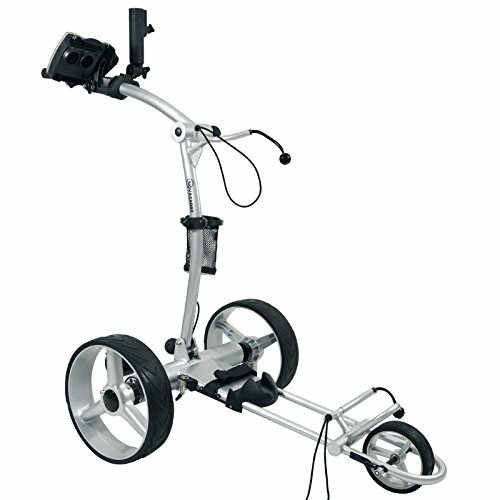 They were originally meant for the senior generation of golfer to relieve the physical issues of carrying their golf bags over the course, but now all age groups are now utilizing the electric golf trolleys due to how easy it is to use them and how they affect the overall performance of their game. Golf isn’t a particularly exerting sport on the outside, proper mechanics come into play. You, the golfers, have to carry the bag with clubs in them and you don’t need someone to tell you that they are heavy. The agility and speed of the electric golf trolley reduce the stress in the muscles, making performance optimum for the game. The best electric golf trolley used should be one that includes rechargeable batteries, is lightweight and strong, and the electrical systems should be weatherproof and temperature tested. Golfers who play numerous rounds should definitely consider buying batteries that come with an extended lifespan, typically around 36 to 48 volts. Models that are high powered are available on the market for golfers who need additional assistance or play on more difficult courses. Some electric golf trolleys can come with remote control functions, and they should all fold up neatly so, then you can store them and carry it so then it into your car and quickly unfold it. How much should it weigh? You have to steer the trolley about, it might be electrical, but you need it to be light enough so it will travel up and down hills, and put it in your car or even take it out of the car. Lead acid batteries can be pretty heavy to lift and lug in and out of your car, but there are other options you can select. What should it be made from? Steel is one possibility, but while it’s durable and stronger than most metals, it is heavier and could be liable to tip over meaning you’d have to lift it and the bag up again. But it would feel lighter if mounted on wheels that are appropriately stable. Aluminium gives an extremely lightweight construction and it will make the trolley seem light to the point it would be almost gliding around the golf course. The only drawback is that it could dent very easily. And lastly, we come to Titanium, which is relatively new to the market. It’s attractive because its lightweight but extremely strong, it’s the perfect blend between Steel which gives strength, and Aluminium which gives it a lightweight feel. The lightweight and strong construction makes it perfect for golf courses. Titanium might be more expensive than the other materials, but that’s not a guarantee. The best electric golf trolley isn’t a problem to steer. Some models come with a basic on/off function and comes with a pre-set power level, but others to consider having a speed dial that allows for more speed that you can control. It is true that some top of the range electric golf trolleys also come with a braking system for slowing the trolley when going down hills, which is recommended if you are a member at a course with steep hills, but you should have something like that anyway. It’s important to have an electric golf trolley that moves quickly, but one you should be able to control with minimal effort, and it should be lightweight enough for you to lug it about the course. You are planning to invest your time and money on an electric golf trolley which you want to be strong, durable, lightweight, but fast and preferably one with a braking system so it can go up and down those steep hills on a golf course. There have been incidents where golfers relying on trolleys had to physically control them as they went up and down steep slopes and it cost them time and energy. Golfers want to save their effort for their swing, and while there are remote control models out there on the market today to allow you to send the trolley around the course, it’s at a healthy price. Comfort and flexibility are important. Remember, you want to purchase not just any electric golf trolley, but the best electric golf trolley. It’s a good idea to make sure the handle of the push or electric is suitable for your height, and you don’t want to bend down to operate it, and potentially suffer back problems. Don’t worry – some models of trolley come with adjustable handles for this purpose, but do keep it in mind before you buy the trolley of your choice. Without batteries, the electric trolley you plan to buy will not travel far. When you do your research into electric golf trolleys, you should investigate the battery life that comes with it and how many holes it should run in to see if they’re durable and long-lasting or not. Recharge times are something else for you to investigate – this varies between 2 to 10 hours. It might be worthwhile for you to carry a spare battery or a longer life battery if you find the speed is dropping before you play 2 rounds in succession. Electric golf trolley batteries are the main maintenance issue, but they can be recharged in a standard electrical outlet. They usually require a timeframe between 8 to 12 hours to fully recharge, so players need to plan accordingly. It’s possible there are other charging options that are available to you. Some can probably be recharged via alternative energy strategies – friction from the braking, or from the kinetic energy produced when the trolley moves. But overall the batteries of the golf trolley are the pricier things to replace therefore it’s crucial you find the best golf cart battery that is long lasting and has enough power. The trolley might even be cooled with water, so to ensure the longer lifespan you want you would need to maintain the supply of water. If they are well maintained by the player, the batteries can last 5 to 6 years, and they should be used until they’re empty and left in the charger until they’re full. Should I buy a gas-powered trolley instead? Gas-powered trolleys are more powerful than their electric counterparts, true. Are they cleaner? No. They are also noisier and will intrude on the game of other players, causing them to lose their concentration and fouling up their swings. Most trolleys like the 3 wheel models come with a range of accessories. One recommended is the umbrella holder as it’s like having a personal caddy walking around the golf course with you to keep you dry on a rainy day. Some other accessories include drinks holders, phone/GPS cradles, distance functions, rain covers, USB ports for charging phones. While some of these features do sound attractive, especially the rain covers and the drinks holders, try to keep your eye on the price tag. It can be expensive having some or all of these fitted to the trolley at the same time. Most modern electric trolleys have some of these features built into the handle anyway so it’s not necessary to have them bought as extras, but plan ahead and work out the cost of the trolley and the features you want it to have. Remote controls are a feature that’s fairly common with most models. 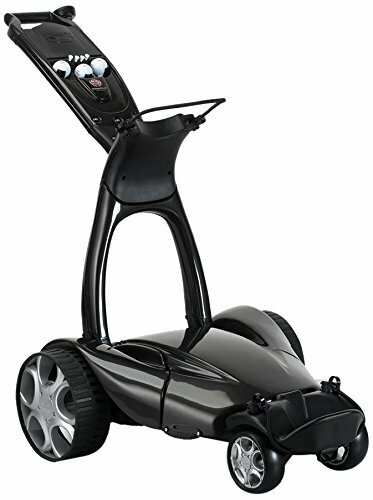 Up to a distance of forty yards, the user can direct the trolley, but while this is an advantage to have for a golfer, it has the drawback of needing stronger batteries. And a skilled operator. Plus, just because there is a remote control doesn’t mean that the trolley won’t sometimes get stuck, or even tip over, without the operator to guide it properly. A variable speed control as a feature means the trolley can maintain a consistent speed regardless of the slopes that could be present on the course. They can simply move in a straight line so the operator doesn’t need to actually push the trolley, but steer it. Models can also come with advanced braking technology. There are displays that allow a user to see the speed, the distance traversed, and battery life. This last aspect makes it easier for the golfer to see how much energy is left in the batteries. Aesthetic features such as drink holders, umbrella holders, rain covers with different colors to choose for each golfer. This is to make golfers feel comfortable with the product’s appearance, and in some cases, it may be necessary to have electric golf trolleys that come with additional storage facilities. Powerful, their motors can climb up hills. Stronger than manual push trolleys. Can reduce fatigue and injury risks to your back. Good quality wheels and construction. They can be more expensive. Less power than gas-powered trolleys. Requires several levels of planning when it comes to charging their batteries. If best folding electric golf trolley will enable you to store it wherever you need in your house or car. The smaller it folds down, the better. Usually, the battery will disconnect easily, so that you can carry the trolley and battery separately to reduce strain. Some if not all trolleys should feature a quick fold mechanism to open and then fold up the trolley so its got a low profile and can be stored away easily and safely. When purchasing the trolley, you should begin by speaking to your golfer friends about their own trolleys, and the pros and the cons of having the different models. Go online after you’ve gotten the details of the trolleys that you are interested in, look at their batteries and how much life they have. Look at the features of the trolley – does it have drink holders? An umbrella holder? Are you satisfied with the weatherproof fittings? Is it manoeuvrable enough for your needs? More importantly, does it hold the weight of the golf bag? The best electric trolley is dependent on your needs and requirements when you are playing golf. It’s true that push golf carts, an older and more conventional technology, have taken a backseat thanks to electric golf trolleys. But while they are lightweight and easy to fold up and don’t require charging, the fact remains that electric golf trolleys don’t require physical pushing with remote control functions. There is also the danger that they would topple over because of their frames, and the bags would sway and they might not be able to carry bags which are quite large. Push trolleys with sturdier frames, lower centers of gravity, and strong wheels are the better option. But electric golf trolleys, despite their heaviness and batteries, yet their carrying capacity is far superior. A golfer can also enjoy features and capabilities with an electric golf trolley that they’re unable to enjoy with a push trolley. 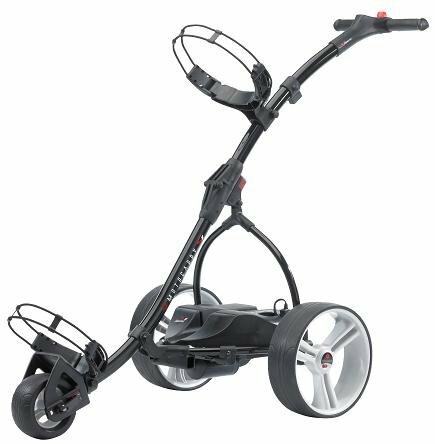 A serious golfer should want a trolley with a powerful motor suitable for climbing hills and slopes and can brake. To do this, it will require suitable batteries that can be charged, built from a lightweight but strong material, with good quality wheels. Some top models will have remote controls, giving the players the means to steer and control the trolley without needing to even touch the handle. Should You Buy An Electric Trolley For Golf? 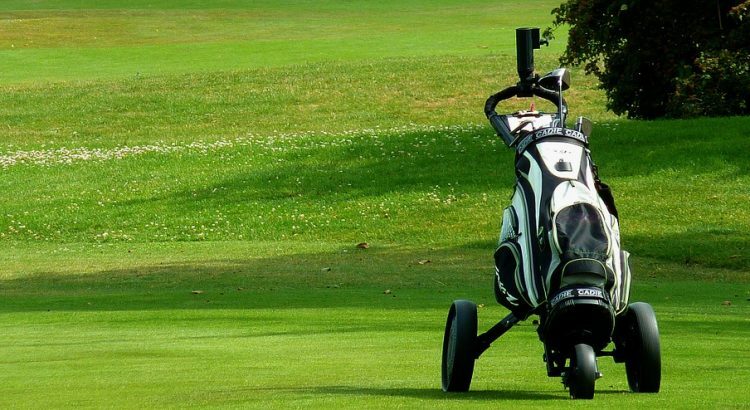 While the electric golf trolley is believed to just be an aid for senior golf players to relax the toll golf can take from walking the course with their bag, they are becoming popular with golf players of all ages. Push trolleys have been around for a long time, but their lack of sturdiness could mean it could tip over more than once, and the strain of constantly picking up the bag and bending down could affect the golfers’ health. The best electric golf trolley should be affordable and flexible enough to carry the bag and move the equipment over the course and shouldn’t require any physical exertion besides getting the trolley out of the car, unfolding it, and putting the bag onto it. They should also have rechargeable batteries which you can monitor as the day on the course goes on. Electric golf trolleys you should look into should be flexible, easy to fold, easy to charge and comes with batteries that have a long lifespan, remote control functions, an alternative method for charging – either friction based or kinetic – though they can look at the extra features like drink holders though it might be better and more beneficial to have rain covers and umbrella holders. Buyers with more physical limitations will find it more advantageous to have an electric golf trolley instead of a gas-powered trolley. Granted, a gas-powered trolley is more powerful, it can climb up steeper hills, but they are heavier, they emit more dangerous emissions. An electric trolley is a better one. It’s cleaner, it doesn’t emit carbon and any dangerous emissions that affects the environment. They just need recharging. They are lighter, more compact. The electric golf trolley is probably the best option you can look for, and there are different models for you to look out for, each with its own reviews for you to look into, and different features that you might find attractive but efficient in the long run. Simply decide on the amount of money you plan to spend, read the reviews, ask questions and ask for recommendations.